commonly seen in the Eastern States such as New Jersey and Florida. Their docile nature and strength makes them easy to look after. However, the true appeal of this snake lies in its genes. The spectacular colour of Corns is enough to leave any snake lover fall for them. After mating with one another, it results in creation of new and unique colour patterns in the offspring. This is one of the reasons why both breeders and hobbyists absolutely love this snake. Ball Pythons are also revered amongst the snake lovers for their diverse colour patterns. Their demand is so high that some of them are sold at the price of $50,000. This African snake species is popular for its defence strategy. It is capable of curling itself into a tight ball with its head protected by the muscular and strong body. At the time of attacking its prey, the Ball Python constricts the prey, squeezing so hard to an extent that the animal dies within a minute due to lack of blood flow. Despite having such brutal power, it is an extremely docile animal in captivity. It makes a great pet for first time owners. Since, the Ball Python measures approximately 5 feet, you have to have a spacious place for your snake before bringing it home. This snake species love feasting upon rattle snakes on a regular basis. With a muscular and strong body, measurement over 5 feet, and an unparalleled temperament, California King Snake definitely lives up to its name. But, as ironical as it may seem, they are also the most popular pet snakes. The interesting aspect about these snakes is that if you handle them with love and affection, then they transform into a docile and sweet pet. If you’re wondering about how to get Rattlesnakes for feeding your California King Snake, then it’s about time you should stop bothering about it because you always have an option of feeding them mouse. There are some striking similarities between King Snake and Milk Snake. In fact, the hybrid of both these snakes is popular amongst pet snake lovers. It is to be noted that a genuine/real Milk Snake is far superior in terms of beauty and skin texture. The defence mechanism of this snake is relatively weak when compared to above mentioned snakes, so Milk Snake chooses to imitate other snakes. Generally, Milk Snakes are known for mimicking Coral snakes that are known for their deadly venom. Milk Snakes are devoid of venom, so they are absolutely harmless to humans. If you are considering keeping a snake that’s absolutely harmless and docile, then you won’t get a better option than Milk Snake. Most Coral snakes resemble Milk Snakes, so it’s extremely difficult to differentiate them. It’d take a snake expert’s knowledge to differentiate between these two species. Known for exceptionally effective predator skills, which enable this snake to take down even largepreys like ocelots, Boa Constrictor has a lot in common to Ball Python. Initially, the Boa Constrictor squeezes its prey, and using the razor sharp teeth & extremely powerful jaw muscles, this snake slides down the animal in less than a minute. Measuring up to 10 feet, this snake species is not ideally suited for the first time pet owners, or those with a small house. In order to keep them as a pet, you may require a special enclosure. Most hobbyists consider building the enclosure on their own. You can get a terrarium for Boa Constrictor from pet market, but you should have sufficient space in your home for keeping them without causing any discomfort to your family members. This snake is affordable and also one of the most commonly found snakes in the U.S. It requires regular fish diet in order to perform properly, which might seem like a problematic affair for the owner. Most Garter Snakes are harmless because they don’t possess venom. These snakes tend to vary on the basis of their colour pattern and body type. Most Garters have three longitudinal stripes. Generally, the stripes are greenish or yellowish. As mentioned earlier, the colour patterns tend to vary depending upon the region, but it’s rare to find a Garter snake without stripes. These snakes usually measure anything between 23-30 inches. Though, in some cases, they can also measure up to 5 feet. An interesting aspect about this snake species is that they can have two-coloured tongues. 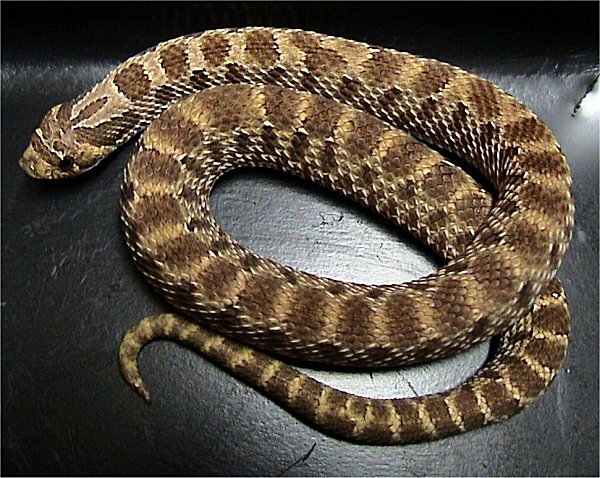 The Eastern, Western and Southern are three primary Hognose species commonly found in the Snake pet market. Of all the three types, the Western species of this snake is usually kept in captivity. During their initial years, these snakes are small sized, but as they grow, their size varies between 14 to 40 inches. Interestingly, the size of females is more than male Hognose snakes. The natural prey of these snakes is toads. Hognose snakes are revered for displaying their defensive skills, which mostly includes hissing, inflating their body, hooding their neck, and if everything fails, then rolling their body and playing dead. When enacting like a dead, they open their mouth and keep tongue hanging out of the mouth. In order to keep this snake as a pet, you’d have to have abundance of knowledge about their food pattern, characteristic traits, sleep requirements, etc. Proper knowledge about the snake helps in strengthening your bond with it. Some snake species are one of the most docile pets one can have while there are others that are never meant to be kept as pets. You have to know the difference between these two basic types of snakes. Apart from this, keeping snakes as pets would require in-depth knowledge and mental toughness. If you are willing to take up the challenge of looking after the snake as a part of your family, then you should head straight to the pets market and get one of the snakes mentioned in this guide.